Published in the Wall Street Journal on April 22, 2018. By Julie Halpert. Tennis, golf and an attractive clubhouse have long been staples in the universe of 55-plus communities selling an active lifestyle to retirees. But a growing number of such communities are trying a different message directly geared toward baby boomers: highlighting the eco-friendly features of their developments. As boomers retire, downsize, or just look for new homes that better fit their current needs, more 55-plus communities are competing based on features like solar panels, water reclamation, energy-efficient appliances, and windows with low-reflective glass, says Samantha Reid, a spokeswoman for 55places.com, an online resource for information on active-adult communities. Houses with eco-friendly designs may cost more than similar homes without them. But developers of 55-plus communities say many baby boomers are willing to pay the price. Jeff McQueen, president of Scottsdale, Ariz.-based Shea Homes Active Lifestyle Communities, a division of privately held Shea Homes, says his company makes a considerable effort to design and build energy-efficient homes, based on an internal study of boomers that indicated 50% desired energy-efficient and sustainable features in their homes. Consider Mary Anne Graf, age 70, and her husband, Paul, 71, who bought a home in a Shea Homes Trilogy-branded 55-plus community in Denver, N.C., last August for $515,000. The Grafs paid more than they would have in slightly less-expensive active-adult communities, in part because of a $29,000 solar-energy package. But they say they chose their home partly because of that solar option. Similarly, at Robson Resort Communities , a company focused on 55-plus buyers in Arizona and Texas, Chief Financial Officer Steve Soriano says his company’s research shows more than a third of its prospective buyers seek an energy-efficient and environmentally friendly home. All new homes in Robson’s Sun Lakes, Ariz., development are Energy Star-certified, a federal measure of high energy efficiency that takes into account such features as insulation, building materials and window types. Robson communities also design their landscaping and golf courses to reduce water runoff and evaporation, and have their own wastewater-treatment plants that reclaim and reuse water. According to the company, the use of reclaimed water reduces the cost of irrigating the golf course and community landscaping for each community by 50%. Environmentally friendly designs have become necessary to compete, says Marshall Gobuty, developer and majority owner of Mirabella, a 55-plus community under construction in Bradenton, Fla. To that end, Mr. Gobuty and other developers are increasingly pursuing so called LEED certification, an official stamp of approval from the U.S. Green Building Council that says a building or development meets the council’s Leadership in Energy and Environmental Design standards. LEED certification requires meeting a long list of conditions, including proximity to transportation, water efficiency, energy usage and sustainable materials. Mirabella has received LEED certification for all of the 90 villas it has built so far (out of a total 160 to be built.) Energy-efficient features in the villas include LED lighting, double-pane vinyl windows and extensive insulation. For the last 25 homes to be built, there also will be a community charging station for electric vehicles and solar panels. Mahesh Ramanujam, president and chief executive of the U.S. Green Building Council, says his organization has seen a steady uptick in 55-plus communities seeking LEED certification in recent years. Last year, 24 developments received LEED certification, and 16 are already in the process so far this year, he says. Mr. Ramanujam says his group expects that the number of projects being certified will double each year over the next five years. LEED-certified projects see an average 25% reduction in energy costs, says Mr. Ramanujam. At Mirabella, Mr. Gobuty says LEED certification has added 12% to 14% to each certified home’s cost. But, again, in the company’s view, that extra cost pays for itself. All but 22 of the project’s planned 160 villas have been sold. Mr. Gobuty says he is also developing a 55-plus community in Ellenton, Fla., that will feature 600 net-zero-energy homes, a type of home that is largely energy-self-sufficient. In net-zero-energy homes, the total amount of energy used in a year roughly equals the amount of energy created on site—mostly through use of solar panels. Thus, in theory, depending on the utility, residents of net-zero-energy homes may not have to pay an electric bill. Meanwhile, it isn’t just 55-plus communities that are focusing on green living. There is also a growing movement in senior housing known as cohousing, in which homeowners have their own units but share a common living space and other resources. 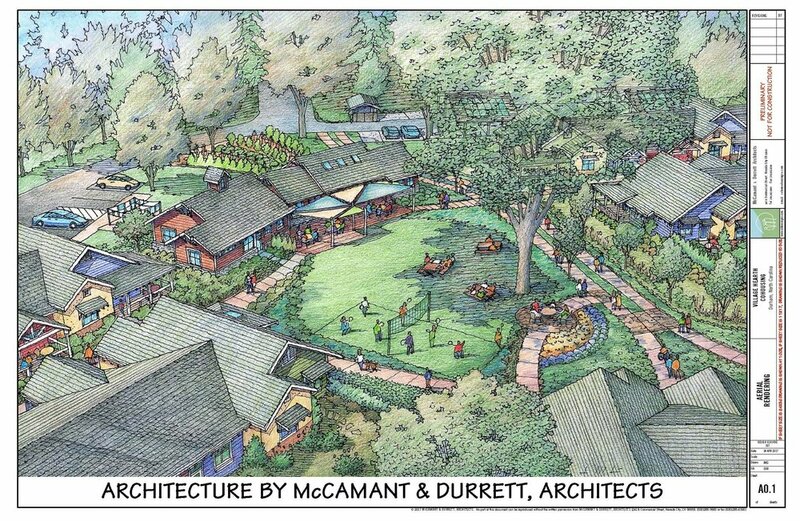 Currently, there are about a dozen senior cohousing communities in the U.S., according to the Cohousing Association of the U.S.
Charles Durrett, a Nevada City, Calif., architect who specializes in cohousing units, says “living lighter on the planet” is a big goal for every senior cohousing community he encounters. At Village Hearth Cohousing , under construction in Durham, N.C., homes will be clustered on 15 acres, preserving 10 acres of green space. Ms. Halpert is a writer in Michigan. Email her at reports@wsj.com.